In honor of Chocolate Month and Valentine’s Day, I’m sharing a recipe for an exotic flavor trio of the romantic French macaron – a rich, sensual chocolate with rum ganache filling; a tropical basil-lime; and a buttery dulce de leche peanut. All three variations – the trois façons – are certain to impress. I have been baking since the age of eight. I love mixing, tweaking great batter, and I have a love-hate relationship with the element of unpredictability of baking. How can I use the same proportions of ingredients but always yield a slightly different end product? Most of the time, the variation doesn’t really matter. I’ve always been intimidated by dishes that require precision, especially when it involves the somewhat unforgiving egg white. French macarons fall into that category. So I was quite impressed when my friend Kristine told me about her 3 am baking adventures making French macarons from an Otto Lenghi cookbook. She assured me that if she could do it, I could as well. I was very thankful when she was willing to walk me through the process. I’m sharing all three varieties we tried, as the recipe for the meringue base is designed to be split three ways; but divide the recipe into thirds if you would like to make just one variety. My personal opinion is that the dulce de leche peanut (salted caramel peanut) is a bit too sweet for my tastes, but it is the easiest to make – perfect for a first attempt. The other two varieties I will share were a surprisingly amazing lime-basil and a chocolate with rum ganache filling. The two flavors couldn’t be more in opposition, which in a way, makes them the perfect duo to share with your guests: one light and exotic; the other dark and subtle. Whipping the egg whites and superfine sugar is made much easier with a stand mixer, but it is possible with whatever kitchen tools you have on hand. A note about handling the egg whites: typically, egg whites can be very unforgiving (deja vu, perhaps? ), requiring purity and a deft touch with the mixer – not to be under beat or over beat! In this case, the merengues were more resilient than I expected. I contaminated some of my whites with a bit of yolk during the separation process, and while it took a bit longer to whip to a soft peak consistency, they turned out fine. Kristine realized she had under beat her egg whites herself on her first attempt, but the end product turned out perfectly fine. So if you aren’t the greatest at separating eggs and are intimidated to handle egg whites, not to worry. Sift confectioners’ sugar and almond meal together in a large mixing bowl. 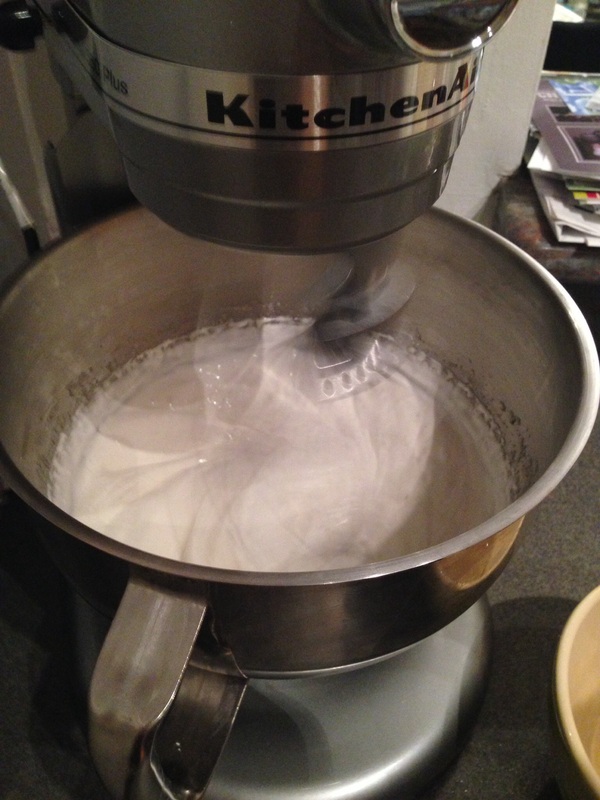 Meanwhile, using an electric hand or stand mixer with medium mixing bowl, beat the egg whites on high speed, gradually adding the superfine/granulated sugar once the mixer is switched on. Beat until the meringue reaches a soft peak stage – it thickens and the mixture holds its shape fairly well; Otto Lenghi describes it as a “thick, aerated meringue, firm but not too try.” Fold approximately 1/3 of the meringue mixture into the almond-confectioners’ sugar; much of the mix will remain dry and somewhat firm. Gradually fold another third of the meringue into the dry mix. Add in the vanilla and salt. Finally, fold in the last third of the meringue until just incorporated. Do not over-mix. The resulting mixture should be fairly glossy, moist, and thick. It need not be smooth. Follow the below instructions to adjust this meringue base as directed for each flavor variation. To pipe and bake the meringue cookie base, use a pastry bag fitted with a round tip OR #developingkitchen: fill a gallon-size zip-sealed plastic bag; cut a fine slit in one bottom corner of the bag. Pipe the meringue batter through this slit to form roughly U.S. quarter-sized (1 to 1 1/2 inch) discs; this step works best when you leave the tip stationery until the mixture spreads outward into discs on its own. Let the rounds rest for 15 minutes uncovered before baking. Bake at 325 degrees for 12 minutes – or until the cookies can be removed from the Parchment paper easily with an icing spatula. Remove the cookies from the baking sheet (can lift the entire Parchment sheet of cookies) and set aside to cool. 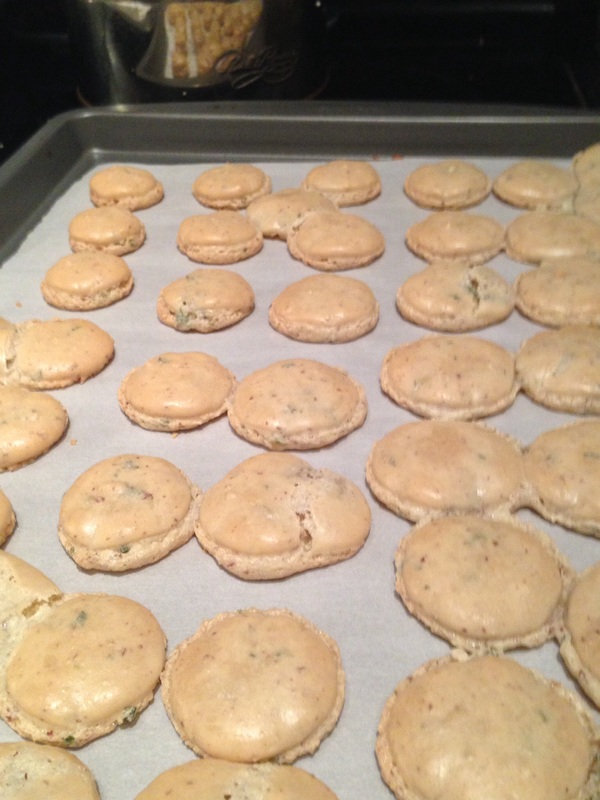 To assemble the macarons, pipe or spread a pea-sized dollop of filling onto the center of the flat side of one meringue. Place a second meringue, flat side down, atop the filling and press together slightly. Allow the sandwiches to set for a few hours before serving; store in airtight containers. Separate out one-third of the basic meringue mixture and place in a gallon-size plastic bag or pastry bag as directed above (no further modification of this cookie base is needed). Pipe and bake the meringues as directed above – simply sprinkle 1 tbsp. chopped peanuts atop the meringues before baking. To make the filling, mix 3 tbsp. chopped peanuts and the salt into the prepared dulce de leche. When meringues have cooled, assemble macarons with this filling as instructed above. Separate another third of the basic meringue base into a small mixing bowl. Fold half of the chopped basil and lime zest into this mixture; then fill a pastry bag or plastic bag, pipe and bake meringues as directed above. To make the buttercream filling, beat together butter and confectioners’ sugar with a rubber spatula or wooden spoon.. Add the other half of the lime zest and basil, as well as the lime juice and mix until fluffy and incorporated. Cover and store outside of the refrigerator (away from heat) until ready to assemble. Assemble macarons as instructed above. In the original mixing bowl, fold the 2 tbsp. cocoa powder to the remaining third of the meringue base mixture. Pipe and bake according to instructions above. To make the ganache filling (can be done ahead of time, such as before making the other macaron varieties), heat the cream in a small saucepan and bring to a boil. Remove from heat. Place the chocolate and butter into a heat-proof bowl (or Pyrex liquid measuring cup). Pour the hot cream over the chocolate and butter. Stir gently with a rubber spatula until smooth and glossy. Stir in the rum until fully incorporated. Cover and allow the ganache to cool to room temperature (do not refrigerate). Assemble the macarons as instructed above.